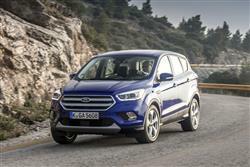 Few markets evolve as rapidly as the compact SUV and you only need look at this improved second generation Ford Kuga to realise what it takes to keep pace. It's smarter and better connected and will appeal not only to the RAV4 and CR-V compact SUV crowd but also to those looking for one of the better 'Qashqai-class' Crossovers. There's no seven-seat version and it's still no great shakes off road but giving a car of this kind some serious off-road capability usually compromises it on road. I think this is one of those vehicles that would work really well as a long term ownership proposition, especially in 2.0 TDCi diesel form. Ford ought to be number one in the SUV and Crossover segment, but in recent history, the company has had a strangely half-hearted attitude to cars of this kind. In the Nineties and early Noughties, we got a stream of fairly awful Blue Oval-branded SUVs. There were two Mavericks, one based on a Nissan, the other on a Mazda. And a thirsty Explorer model from the States. Only in 2008 did Ford properly commit and develop from scratch a car better suited to our market. The first generation Kuga was fun to drive and looked good but it was rather cramped in the rear and needed a touch of cabin quality. The second generation Kuga, launched in 2013, addressed both these issues but by 2016, its standards of media connectivity had slipped a little behind the class standard, hence the need for the improved version we look at here with its smarter looks. Since most custmers will want the 2.0-litre TDCi desel engine, that's what we're focusing on. This has always been one of the very best family-sized Crossovers to choose if you like your driving. There's a torque vectoring control system to reduce the sort of understeer you'd expect in a car of this type and the Kuga has always performed well in terms of ride quality and refinement. Most UK buyers will probably choose one of the two 2.0-litre diesel engines on offer. Here you choose between a 150PS 2.0-litre TDCi unit, which is expected to be the volume seller, or a range-topping 180PS version of this engine. The 150PS unit is available in manual front wheel drive guise too, which is the most economical model in the range, or you can buy a four-wheel drive version and specify it with the Powershift transmission if you fancy. The 180PS engine is only available with four-wheel drive, again with the option of Powershift. I think the front-wheel drive 150PS unit might be the bargain of the range, as there's very little difference in torque between these two engines and when the more powerful model is loaded up with all-wheel drive, Powershift and a few options, there's relatively little difference in their sprinting ability. With a manual gearbox and AWD, the top diesel takes 9.2 seconds to 62mph, while the entry-level car in the same spec manages 10.1s. Although Ford's engineers deny it, the chassis of this model feels a good deal softer than the pre-2013 first generation car, so the ride is better, but there's not that same up-and-at-'em attitude as before. The four-wheel drive system lends the Kuga a bit of off-road ability but it's probably more useful on road when conditions are slippy or if you're driving the car quite hard. The torque vectoring control system reduces the sort of understeer you'd expect in a car of this type and sniffs out grip extremely well. There are three Kuga trim levels - 'Zetec', 'Titanium' and 'ST-Line' and for the 2.0 TDCi engine we're looking at here, prices start at around £25,000. If that's a bit much for you but you still want a diesel, then Ford will offer you a 1.5-litre TDCi 120PS model for just under £23,000. There's a choice of front wheel drive or AWD and if you go for the AWD version, your dealer will give you the option of paying around £1,600 more for the 6-speed Powershift auto gearbox. Go for the pokier 1980PS version of ths engine and you have to have AWD with either 'Titanium' or 'ST-Line' trim - and that means asking prices between £28,000 and £31,000. You get plenty of technology for your cash though in this revised model. Take the new 'SYNC 3' connectivity system. It delivers faster performance, simplified commands and supports the 'Apple CarPlay' and 'Android Auto' smartphone connectivity systems, so you can use your favourite apps on the dashboard's 8-inch colour touchcreen. The new Kuga also features Ford's Perpendicular Parking technology that helps drivers park handsfree in spaces alongside other cars. Plus there's an enhanced version of the 'Active City Stop' collision avoidance system. And Ford's 'Adaptive Front Lighting System' for optimised visibility in low light. Further advanced technologies include a 'Hands-Free Liftgate' powered rear hatch that you can activate by waving your foot beneath the bumper. How spoiled we are. These days we expect our cars to be bigger and faster, with more equipment and better build quality. We want more effective air conditioning, power outlets everywhere and brighter headlights. We want all of that but we also want to spend less on fuel and emit less carbon dioxide. Which, when you think about it, is quite a trick to pull off. We almost take it for granted that we have our cakes and eat them too and this Kuga is a case in point. ord has pulled out all the stops to make the latest model more economical than before. For example, an Active Grille Shutter is fitted to all versions. This closes the front grille, reducing aerodynamic drag when the radiator isn't in need of additional cooling and then reopens it upon demand. Auto-Start-Stop is also standard across the range. Features like an Eco Mode and a Gear Shift Indicator help keep your right boot out of the carpet. All this effort has paid off in terms of efficiency. The 1.5 TDCi powerplant manages 58.8mpg and 124g/km. And the front-driven 2.0 TDCi 150PS model manages 60.1mpg and 122g/km - or 54.3mpg and 135g/km if you order it with AWD, figures duplicated by the top 2.0 TDCi 180PS AWD derivative. The three/year/60,000 mile Ford warranty isn't the industry's most generous but reliability of all of these drivetrains has thus far been extremely good. The Ford Kuga is a car that rewards a bit of time spent with it. Look at it superficially and it's fairly easy to find rivals with more space, that drive a bit more sharply, that offer better fuel economy, wear a more prestigious badge or feel posher inside. But when you try to find the car that combines all of these qualities into one, it becomes a bit more difficult and gradually the Ford emerges as a real contender, especially in the 2.0 TDCi diesel form that most UK customers will choose. Of course, it'll have its work cut out. There's some real talent in this compact SUV division and often the decision will come down to something as straightforward as whether you like the styling, whether you can get a discount, or how close your dealer is to you. If you're drawing up a shortlist, by all means put the Kia Sportage, the Mazda CX-5 and the Nissan Qashqai on it. But you'd be missing a trick if you didn't compare them to this latest Ford Kuga. It might just have 'em all covered.